After Sam Spade (arguably before Sam Spade in reputation if not chronologically) the true archetype of the hardboiled, fedora-wearing gumshoe was Philip Marlowe, Private Eye. Certainly one of the major tropes of the genre--the first-person narrated adventure where every woman is a femme fatale--was popularized by Raymond Chandler in his Marlowe stories. 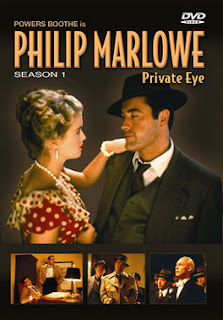 In the early 1980s, HBO ran a series entitled Philip Marlowe, Private Eye. Though it only consisted of two seasons and eleven episodes total, it won awards for Powers Boothe as the eponymous P.I. and it became the very first dramatic scripted series on a cable network. In many ways, without Marlowe, today we wouldn't have The Sopranos, Boardwalk Empire, True Blood or Game of Thrones. The entire series is tough to come by on DVD and goes for a premium if you can, though the second season (mislabeled as Season One) can be had for about 30 bucks. The entire series, however, is viewable for free, on YouTube! Here's a collection of six various episodes. You'll need to search for the others. Between the episode guide on Wikipedia and YouTube you should be able to get them all. Enjoy, while it's still there.